(Newser) – An inmate fell through the ceiling while trying to escape from a jail in Indiana. Jackson County Sheriff Rick Meyer posted on Facebook that 28-year-old Blaze Ayers bolted from officers and locked himself in a medical room on Monday. When officers got into the room, Ayers had made his way into the ceiling, per the AP. The sheriff says Ayers eventually fell through the ceiling and onto the floor of the jail's booking area. Officers used a stun gun to subdue him after he refused to surrender. 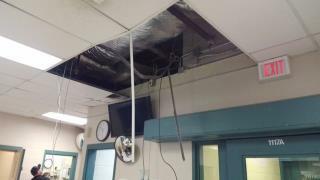 The sheriff says the attempted escape caused extensive damage to the ceiling. Ayers was treated for minor injuries and is charged with attempted escape and criminal mischief. WDRB has surveillance video of Ayers falling from the ceiling. He was a blazing moron. When he hit the ground, he was "stunned" in more ways than one. WHY does everyone try to escape their sentence??!!! Why not just “serve and be DONE ?” with it?!! ?